For my family, that meal is roast chicken, often served with mashed potatoes or even the mixed grains I described in this blog post. I can’t think of anything that makes a house smell better than a roasting chicken and the process is so easy and so rewarding, I can’t imagine not having this solution to so many of life’s problems only a couple of hours away at any given time. In addition to the basic how-to, I offer a couple of tips for just-about-perfect roast chicken. The first is lemon. Stuffing the cavity with half a lemon and resting your bird on a tart yellow bed of lemon slices makes for moister, more succulent meat. And if you make gravy from the pan drippings, the hint of lemon gives it a lighter, more delicate flavor. Tip two is roasting at 425º rather than a lower, slower 350º. This seals in the juices and crisps the skin. Sliding garlic cloves under the skin imparts a richer, more nuanced flavor into the meat. Of course, you can make your bird garlic free if you’re not a fan. But…really, can that be? Click here for the Perfect Roast Chicken Recipe. When you’re finished basking in the glow of that perfect meal, rejoice. There is even more delight to be found in that beautiful bird. Take every bone, yes, the ones on the plates as well as the carcass. Get any bones you’ve saved in your freezer from previous meals and put them in your largest stockpot. Chop carrots, parsnips, onions, celery, and garlic. It doesn’t have to be elegant, just a coarse chop. Add fresh herbs, like thyme, oregano, parsley, and rosemary. Throw in some good white wine – drink a little while you work. Salt and pepper with impunity. Cover the whole thing with water, bring to a boil, reduce to a simmer and cover the pot and leave it alone. While these humble ingredients transmute from the ordinary to the sublime, you can go off and read a book, clean out a closet, write a sonnet, or color your hair. Many hours later, when nature has taken its course, remove the pot from the heat and let this magical elixir cool. Strain off the bones and vegetables, harvesting the savory, golden stock. I put mine into three-cup containers and freeze for up to three months, though they never last nearly that long. But wait…there’s more. Take those veggies that the soup has softened, almost to mush. Pick them out before discarding the bones and put them into your food processor. Puree them and freeze them in very small containers. This flavorful, rich puree is the perfect substitute for flour when you are thickening gravy. Defrost and drop into pan drippings for a gravy that is thick, delicious and gluten free. It’s a wonderful solution for those who are watching their carb intake. But I digress; let’s get back to the soup. It is always in great demand. After a visit, my long-since-grown children have been known to sneak a container or two out the door as they depart. At least one night a week, I drop chopped veggies and a few Trader Joes frozen dumplings into a hot chicken soup bath – the perfect five-minute dinner. It is on hand for medicinal purposes, the perfect antidote for cold germs. Loaded with pasta, this liquid poultry perfection has been known to cure a hangover in less than 10 minutes. Is it magic? Who’s to say? But there are generations of anecdotal evidence to say it might just be so. 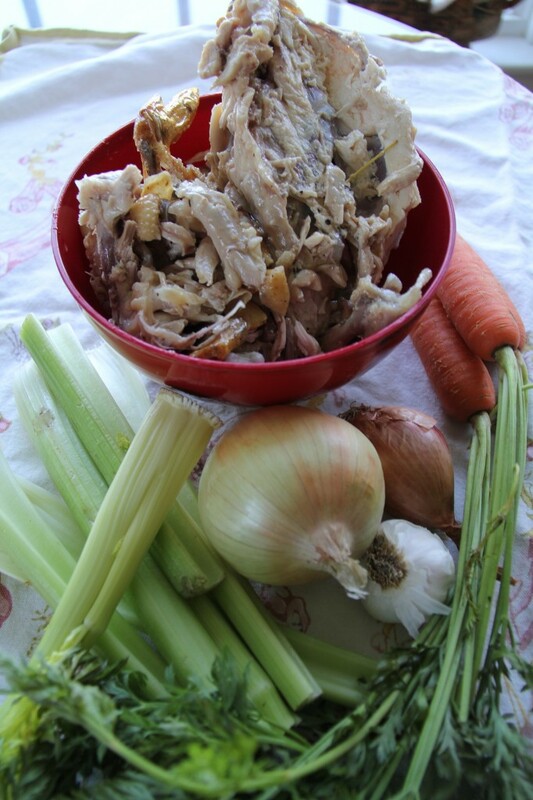 Follow the link to find out how to make this chicken soup for yourself.